Drinks Giant Hopes Partnership Will Boost Appeal of Spirit. David Beckham has been trying out a series of new plays since retiring from soccer last year, including a line of fragrances and plans to buy a U.S. major-league soccer club. Now, he has found another: Scotch whisky. 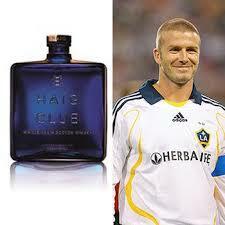 Diageo DGE.LN +1.24% PLC said Tuesday it has teamed up with Mr. Beckham to launch Haig Club—a newly created Scotch that “showcases butterscotch and toffee.” It is the British drinks giant’s latest attempt to attract new drinkers into the fast-growing whiskey category. Terms of the partnership—including any equity interest held by Mr. Beckham—weren’t disclosed but Diageo said the former soccer star would help develop the brand, its strategy and positioning. Diageo said it is planning a global launch for Haig Club later this year, with prices starting at around $65 a bottle, according to a company spokeswoman. The brand will be part of Diageo’s House of Haig, Scotland’s oldest grain-whiskey distiller. “I’m proud to be working at the heart of a homegrown brand which has built an incredible heritage over 400 years,” Mr. Beckham said.